I went on a work-hike with the head of trails for the Connecticut AMC. Our job was to re-flag a re-route of a two mile section of this seven mile section of trail. It seems that two miles of the current trail runs a bit too close to the Schaghticoke indian reservation and it would be easier to move the trail within its corridor than deal with the politics. Also, the current trail has a number of tough to maintain spots in that section: heavy erosion, a bit too steep a climb in places. Finding a new place for the trail to go on rugged terrain is a big job and there are politics here too: this area is loaded with historic sites and if the trail gets too close to them it will mean thousands of people having access to those sites… you get the drift. Just as important as the politics is walkability and how easy it will be to maintain the section. Day and thru hikers will be using this and we want it to be challenging, safe, and enjoyable. And, given that Connecticut is known for its mosquitoes and other delights of summer, it ought not be too wet, not to mention drainage, mud, slippery rocks, etc. Scouting out and building a new trail is a very big job and given that I’ve only done shorter re-routing work, I wanted to get in on it. The initial surveying was done a year ago and this was the third time Jim, my partner for the day had hiked it. I was honored that he asked for and at times used my opinions on various things. For example, both of us prefer switchbacks to too steep a climb. Switchbacks are more work to put in but in the end, they’re easier to walk and easier to maintain. We also like walking on rock, as long as it’s not too steep. Both of us hike this section in winter and glazed rock can be dangerous if one doesn’t have spikes or snowshoes on. We tied bright orange tape flags to small trees, keeping in mind how they hung so they’re visible when the trees leaf out again. We put two tapes around trees to designate turns, similar to the AT convention of two blazes on trees. What would normally take us about an hour on a trail took us three hours through the woods. 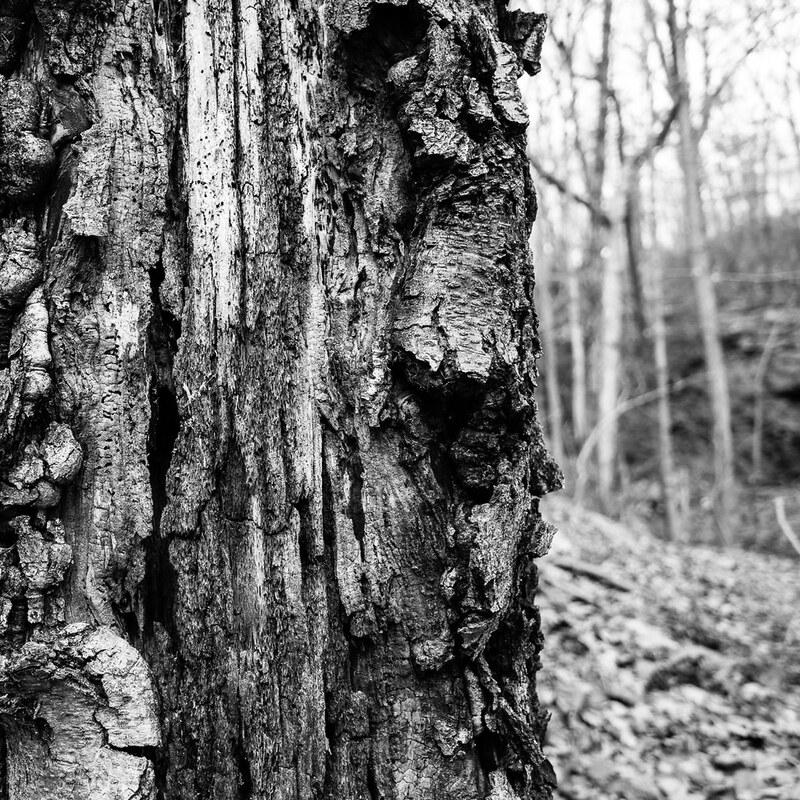 But, it was a beautiful hike and just before we stopped in a small but very steep and beautiful ravine for lunch, I found this old birch tree and decided to add to my collection of old, decaying trees. This was the only photograph I took all day, my hands were full with tape and tools and we were working against the clock. And, here’s the great piece of this: this section of trail will be mine to maintain. I’ll be involved with building the trail as well as maintaining it. I can see a number of future photo essays on this. Sounds like this will be a challenging but rewarding job. I think it will be great, thanks. The bark structures are great as is the background. Thank you Jonne. I keep looking for more of these but I’m getting jaded, they all look the same to me. That sounds like a day very well spent. Thank you susurrus, it was indeed.